When Shall We Be Made Like Our Christ? Q: When will the full change (begun in us by the change in heart) be completed? That is, when shall we be made like our Christ? 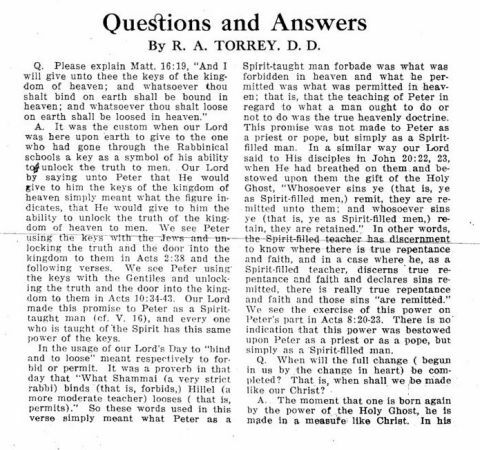 A: The moment that one is born again by the power of the Holy Ghost, he is made in a measure like Christ. In his standing before God, he is just like Christ, perfectly accepted, “justified from all things” (Acts 13:38, 39; Rom. 8:1). Q: Where does it say in the Bible that God prepared hell for man? A: It does not say so anywhere in the Bible. On the other hand we are distinctly told in the Bible that the everlasting fire was prepared for the devil and his angels. (Matt. 25:41). It was not God’s purpose nor desire that any man should go there –it was not prepared for him, but if any man chooses to cast in his lot with the Devil and his angels by persistently rejecting Jesus Christ and continuing in sin, then he shall have to share the destiny of the Devil and his angels, and be “tormented day and night forever and ever.” (Rev. 20:15.) But he goes there of his own choice and in spite of all God’s gracious works to save him. Originally published in The King’s Business, January 1913 (Volume 4, Issue 1, p. 38).